Remember the days of CD’s and DVD’s where you could write your song or documents for keeping an archive? Thanks to the technological enhancement, those days are long gone and replaced with much efficient Hard drives and pen drives . So, what about our homes/structures? Does still our homes been constructed in the same old fashioned way? With pests and water seeping in, like insects? If yes, why do that even when there are absolute , more dependable choices available. One of this very obvious choices is using AAC Blocks (Krrish White Bricks) instead of red bricks at the construction site because AAC or Autoclaved Aerated Concrete Blocks are light weight, precast, high- insulating, load bearing, durable building product, which is available in the market in a wide range of sizes and strengths. 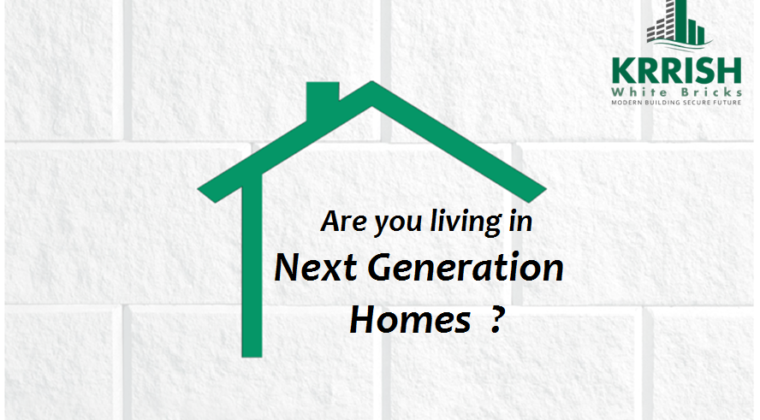 Doing that not only provides you a next generation energy efficient homes but it also helps in cost saving, extensively! Now what are the Benefits for the people who choose to live in an AAC constructed house. AAC has microscopic structure so it does not allow capillary action, making it impermeable to water. Its properties of being a barrier to water is further enhanced by silicon based additives which provides excellent water resistant homes and does not allows water seepage of from exterior to interior of wall where as red bricks houses have to be plastered/repainted in order to remove the seepage usually in span of time intervals. The average unit consumption per day by a customer is reduced half , if the house is built with AAC Blocks. Since AAC blocks has an exceptional thermal insulating qualities which help maintaining the inner temperature to warm during the winters and cool during the summers which leads to savings in air conditioning load and consequently enhance energy efficiency. Using AAC blocks the major cause of pest is removed as it is made from organic materials.AAC block cannot be damaged or infested by termites and other pests.Makes it ideal choice for flooring, roofing and walling solution thus eliminates the chances of pests which carry infectious diseases, infest your kitchens and bedrooms keeping your family healthy and safe. Leading a highly vigorous next generation life which progresses with every new invention, it is high time we start looking into the safety and cost cutting of the homes that we built, taking advantage of the profound AAC Blocks.